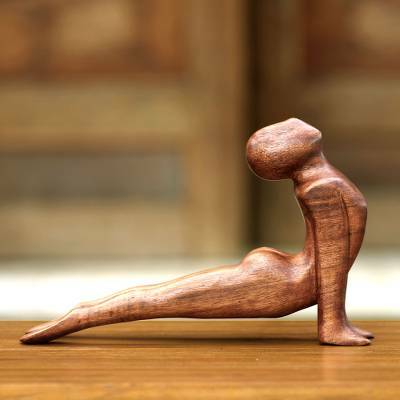 Original Wood Sculpture, "Yoga Cobra Pose"
Wayan Rendah captures the dynamic energy of a man in a yoga stretch. The fluid curves of his taut body are portrayed in a figurative style, heightened by the warm glow of suar wood. Its polished grain enhances the cool line of a beautiful signature piece. You can find wood sculpture 'Yoga Cobra Pose' by Wayan Rendah in sculpture categories such as Abstract Sculpture, Yoga Sculpture and Wood Sculpture. Enjoy exploring these sections for other Novica treasures. A very fine wood working piece! A great gift for those looking to add a beautiful home decor addition! Woodworking isstunning- have this is my yogi den. "A gift for a coworker"
It is a beautiful piece of sculpture. It was packaged and gift wrapped wonderfully. But unfortunately, with all the package around the sculpture, the head was broken off.